Article - 9 A child has the right to live with his parents unless it is judged that this is incompatible for his higher interests. In this case, he has the right to maintain relationships with them, or with the parent from whom he has been separated. If the state is responsible for such a separation, it has obligations to fulfil. It is universally recognised that there is no better setting for the harmonious development of a child than a loving family (This is furthermore one of the themes of article 18 of the Convention). In the 21st century, the increased number of divorces, particularly in Western countries, has resulted in the deterioration of the traditional family unit that consists of a Mother, Father and children. There are more and more blended families, which occurs when adults remarry after a divorce and raise their children together, thus the child will have a stepfather or a stepmother. What will then happen to their relationship with their other biological parent? This question sums up this case file, because numerous situations can lead to a separation temporary or at much longer term between a child and one of his parents, and the purpose of article 9 is to confirm that it is fundamental to maintain a regular relationship between them. What is the responsibility of the state in article 9? What should always motivate the authorities is the idea of the higher interests of the child (Article 3), which is described in the case file to which you will have access by clicking here. Unfortunately parents sometimes behave badly towards their children; in some cases the families are separated because the authorities may have to take corrective measures such as, for example, imprisonment of one of the parents in the event of a criminal offence. 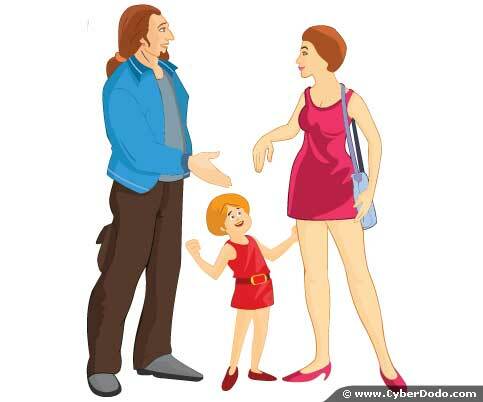 Even in these delicate situations, it is necessary for the proper development of the child that he maintains a relationship with his parent or parents (Except, of course, if his physical or moral integrity is under threat = See the article on higher interests). In order to do this, the state must guarantee the indispensable conditions for the maintenance of the said relationship, notably, qualified staff to monitor them and appropriate places for them to meet.